Question - What does a Jordi Savall sideman do to let his hair down? Answer - Make an album scored for electronic samples, keyboards, vibraphone, marimba, cardboard tubes and much else, but with the viola da gamba notably absent. All that recent talk about authentic performances prompted me to share with you a delicously inauthentic album that has been a favourite on my iPod for a long time. 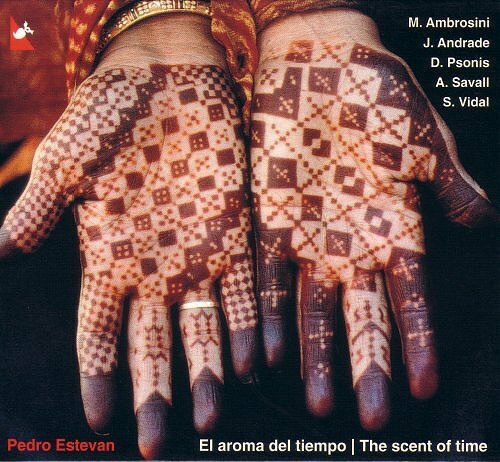 El Aroma del Tiempo (The Scent of Time) comes from Pedro Estevan, who is best known as the percussionist extraordinaire on many Jordi Savall projects. 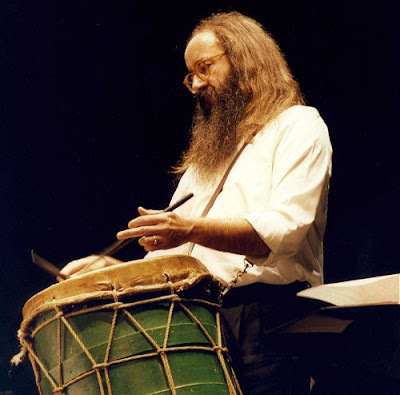 After studying at Madrid's Conservatory of Music he studied contemporary percussion with Sylvio Gualda, who worked frequently with Iannis Xenakis, African percussion with the Senegalese griot and teacher Doudou N'Diaye Rose, and tambourine with frame drum master Glen Velez. Despite contributions from several other musicians familiar from Jordi Savall albums, notably Dimitris Psonis on lute, tar and bouzouki and Jordi's daughter Arianna on baroque harp, El Aroma del Tiempo is most definitely an early music-free zone. Which means it thankfully avoids the 'easy early' trap that Savall sideman Rolf Lislevand falls into on his ECM albums. All the tracks bar two on Pedro Estevan's album are composed by the multi-talented percussionist himself, and when I tell you that the first cut on this category defying disc is titled Combustión espontánea (Spontaneous combustion) you will start to get the idea. Released in 2001 on the enterprising and independent Spanish Glossa label and available in CD or MP3 formats, El Aroma del Tiempo is the perfect cure for authentic performace fatigue. And if, like me, you like the cover art, try this. * The booklet for El Aroma del Tiempo, with selections from Javier Marías, H. G. Wells (who proved the albums title via A Time Traveller - "Can an instantaneous cube exist? "), Marcel Proust and Rainer Maria Rilke is truly eclectic. But the gem is the Spanish dedication from Pedro Estevan which translates as "I dedicate this music to all the people who treat me so well and take care of me in hotels, restaurants and bars where I spend more than half of my life". That is the peripatetic Senor Estevan in non-electric mode with hair most definitely let down above. I don't know this album at all, but am familiar with the "cast" and your left field recommendations rarely disappoint, so I will check it out. I am actually quite fond of the first Rolf Lislevand ECM, but haven't played the second more than a couple of times, and do know what you mean by "easy early". Hovever, your references to both electronic samples and ECM made me thing about the Ambrose Field/John Potter disc, Being Dufay, which was most certainly one of my recordings of the year a couple of years ago. Do you know it?